Welcome to my Ubuntu Dapper and Ubuntu Edgy repository, for i386 and AMD64 architectures. You can read all news in the ChangeLog (and in my blog, in french). If you want to contact me, you can use this form . 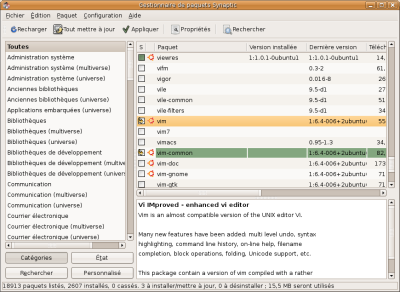 The AMD64 version of the repository is maintained by The Glu. You can contact him with this form. Thanks to our partner Asher256, Blog sur l'Actualit� Informatique. Package should respect both the Debian Policy and the Filesystem Hierarchy standard. I've done my best to respect the goals I established, but there are still some exceptions to these rules! Few packages thus don't respect all my objetives. But don't worry, it doesn't reduce their quality and those packages remain perfectly working. To have a description of the packages available, visit this page : The packages.